Jennifer Derksen will be back with us for another enlightening weekend of riding! Jennifer Derksen is one of only a handful of Level II Mastery, Ride With Your Mind Coaches in North America certified by the internationally renowned Mary Wanless. 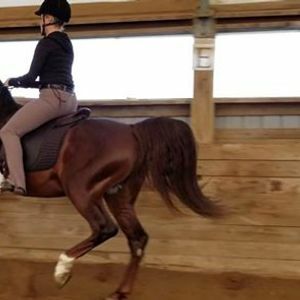 Passionate about coaching riders, she has specialized skills to help you organize your body in a way that creates a positive interaction with your horse. Giving you tools to improve your core stability, breathing, balance and helping you obtain a more secure seat. The techniques she’s use will improve your confidence and ultimately make you a more effective rider. You will see positive changes in both yourself and your horse in your very first lesson. Lessons are $110 for 45 minute private session with Jennifer. It is strongly encouraged that you commit to riding both Saturday and Sunday. Spaces are limited and are not guaranteed until they have been paid for. Ship-ins welcome, PM Lauren for additional details. Auditors 20$/day. As usual we will host a potluck both days. We hope you will join us! Kingston Roller Derby Presents Silence of the Jams!